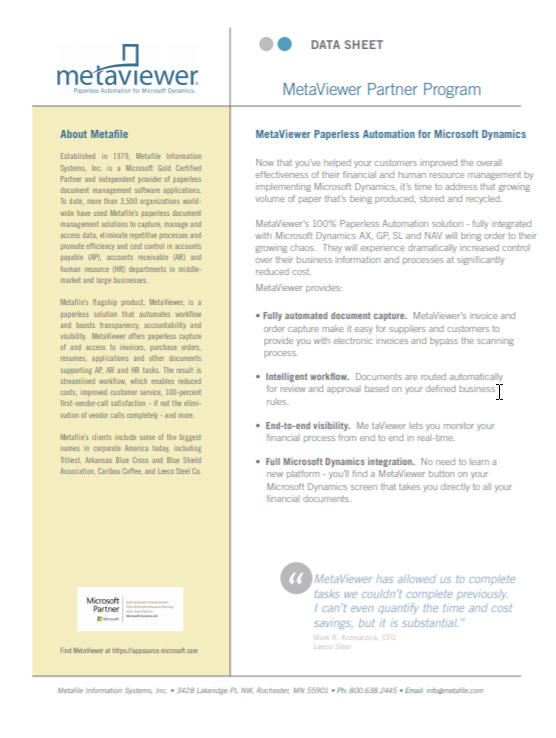 Whether your clients want to reduce the cost of invoice processing and delays, eliminate unnecessary duplication of work, or increase visibility into their accounts payables and receivables; Metaviewer is the one paperless automation solution that is tightly integrated with Microsoft Dynamics while providing the affordability expected by mid-market clients, and the scalability demanded by enterprises. It is very likely that you already have customers who have a need for workflow automation. You can use your existing relationships to ask a few simple questions to be able to fulfill their immediate need and quickly justify their purchase on the basis of a compelling ROI. Virtually every manufacturer, retailer and wholesaler/distributor that processes 1,000 or more invoices per month is an ideal MetaViewer customer, and the cross-industry need for integration between AP, AR, HR and ERP technology has never been greater. There has never been a better time for VARs, referral partners and systems integrators to incorporate affordable, measurable value into Microsoft Dynamics and other ERP solutions with Paperless ERP automation technology. Cross-industry demand for accounting automation technology ­– MetaViewer is proven to address ERP pain-points that are common across all industries, lowering invoice-processing costs, enabling visibility into business processes, ensuring prompt orders and invoice payments, and improving efficiency by mitigating duplicative efforts and rekeying of paper-based data. More, and higher-value ERP sales – A combined solution offering integration between MetaViewer and an ERP solution enables significant cost savings, presenting opportunities to make ERP solutions paperless and affording accelerated ROI when compared to standalone ERP implementations. Increased partner revenue – The value of new-customer ERP sales incorporating MetaViewer can be increased 25 percent, and current customers can be offered a fully integrated paperless ERP solution that affords tangible ROI. Proven ROI through ERP integration – Midmarket companies processing paper-based invoices typically carry a $20-per-invoice processing cost; MetaViewer can lower that cost to $5 per invoice, generating significant and easily justifiable annual ROI. MetaViewer + Signature + Microsoft Dynamics GP = out-of-this-world efficiency. Encore Project Tracking + MetaViewer: Tailored for nearly any business.